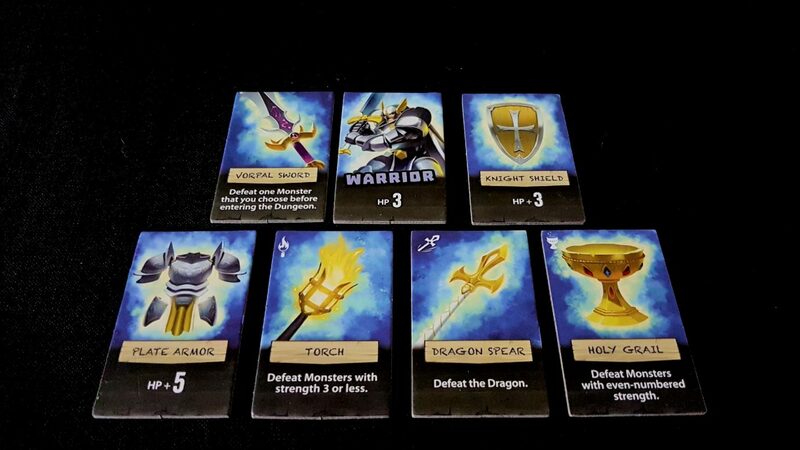 Welcome to the Dungeon is an extremely light and breezy game that adds a dose of bluffing and misdirection to your day and then departs without overstaying its welcome. We gave it three and a half stars in our review. It’s tightly designed, very clever, but there’s only so often that a box like this can be brought out for game night before its fundamental simplicity becomes a disadvantage. We certainly think it deserves shelf space though so the next question we need to address is – are you welcome in this dungeon? Let’s find out. We’ve got a (mostly) clean bill of health here. Colour is used to indicate individual hero roles, but it’s not the sole channel of information used since each character archetype has its own distinctive art. I guess that’s why they call it the blues. That’s as good a reason as any. You know the song never explains it? This might be a slight problem when it comes to setup because the equipment used by heroes is classified according to the same colour code and there’s no other way to work out which piece belongs with whom. However, you can look up this information – it’s not in the manual but it’s also not hard to find. It’ll be obvious from context most of the time too. The invisibility cloak goes with the sneaky rogue. The demonic pact belongs with the wizard. The shield is the warrior’s, and so on. In any case, this is only ever going to be a problem if everyone playing suffers from the same category of colour blindness. So – it’s a minor misstep but not one that’s going to interfere with enjoyable play. Once a hero is ready for the dungeon it doesn’t matter the colour they are allocated. I mean, it’s ‘stupid metaphor, well I guess that explains everything’. A catchy song, but very dumb. Monsters all come with their own individual art, and while the palette will obviously impact on this it’s still attractive across all categories of colour blindness. Monster art and number code, rather than colour, is what conveys the information regarding this element of the game. We strongly recommend Welcome to the Dungeon in this category. The core gameplay activity is looking at a card and deciding whether it’s going into the dungeon. If it’s not going into the dungeon, it’s necessary to decide which piece of equipment will be sacrificed. As is usually the case this isn’t going to be possible in situations of total blindness, but the game should otherwise be playable as long as there is some ability to make out light and colour. 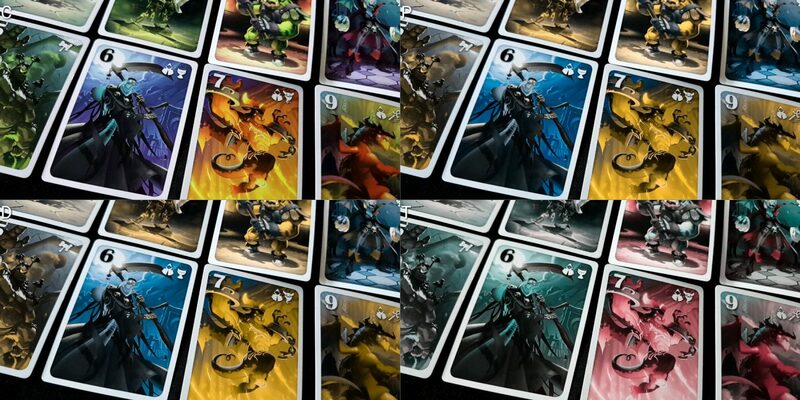 Card art is very distinctive, and each card has a large and well contrasted number in the top left hand corner. Information regarding monster weaknesses is also shown in the top right. Don’t get me wrong, I like the song. It’s just – why claim that it gives some insight into the definitional ambiguity that associates blue with sadness? Note here that the Lich (strength six) honours the need for variable contrast by making use of a black number rather than a white one with a black outline. It’s a minor thing, but it really does help ensure readability of the figures. For adventurers the story isn’t quite so positive but the situation is salvaged somewhat by the fact there isn’t a lot of information of which a player needs to keep track. Wait, have I been talking about that song all along? Goodness. Text on these chits is relatively small and often quite dense. 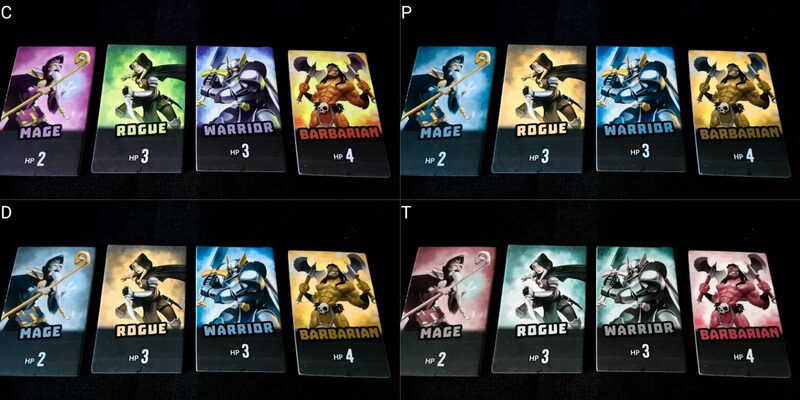 However each hero will have two pieces of equipment that increase HP and the rest have easily expressed effects. Verbalising play and options available can be used to illuminate and reinforce what is currently available. There’s no gameplay information leaked by inquiring what equipment is still in play if necessary although if you ask something like ‘Uh, is the dragon spear still available?’ you might tip your hand (either honestly or dishonestly). The rest of the game focuses on the revelation of the dungeon when a victim is decided upon. That involves turning over the deck and assessing each card against the equipment elements still in play. For the most part this isn’t a visually taxing exercise especially if there is a sighted player available to work their way through it. Otherwise a system of placing cards by the equipment that resolves them will minimise the need to scan between different parts of the game. We recommend Welcome to the Dungeon in this category. Welcome to the Dungeon isn’t mechanically complex but it does put a burden on memory. The gameplay hook is deciding on the appropriate time to jump off of the adventure. 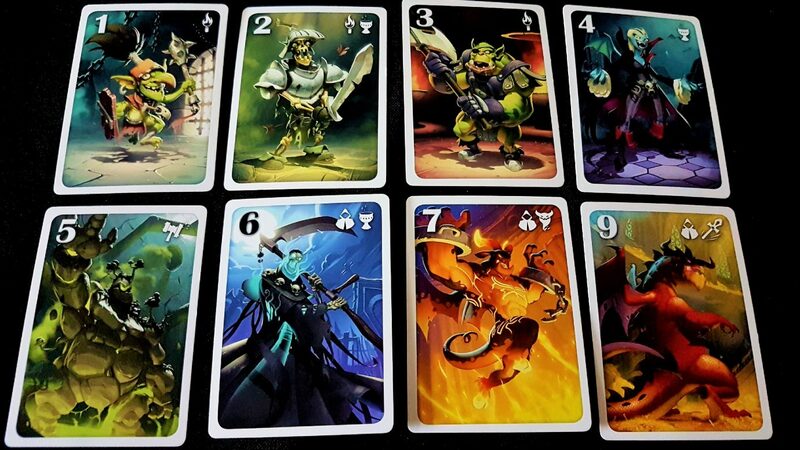 That pivots on what equipment is available and what monsters you’ve seeded through the deck. You won’t know what other players have put in there, but you can infer something based on deck composition. If you just removed a dragon, you know nobody else can put one in because there’s only one in the entire deck. As you make your plays, you reveal something of the contours of the unknown regarding what other players have placed in your way. That’s an appreciation of game state that is going to rely primarily on memory faculties. There’s no significant reading level associated with play but as is often the case in games like this it puts a considerable pressure on a player’s ability to intuit informal values of risk and reward. There is a small degree of formal numeracy (comparisons and arithmetic) but otherwise it’s about the ‘feel’ of probability rather than its concrete assessment. That said, few of the usual areas of concern manifest here – there are no card synergies, or powers that act together in complex ways. The rules of equipment are mostly straightforward and unambiguous, and the flow of play is altered only by people passing. The rules themselves are unlikely to be the factor to cause cognitive concern. Some equipment comes with clarifications in the manual because their effect is not obviously apparent, but more troublesome is that some equipment doesn’t provide guidance or explanation for how it should be used. Common sense mostly prevails here, but as an example the healing potion makes no mention of whether a hero’s armour is replenished when they use it up. It seems obvious that it shouldn’t be, and the text in the rules would imply that’s the case – but it’s not explicitly stated and those infrequent lapses can lead to occasional moments of confusion. Slightly troublesome too is that the game comes with no mechanism for state tracking, which usually isn’t a problem but occasionally can be somewhat awkward. When we play, we stack ‘failed’ cards together and sum up the total to work out how much health damage has been done. We then put together health items to give the threshold at which the journey fails. That works fine in most cases, but it isn’t nearly as elegant when dealing with the ring of power (which adds a monster’s strength to your HP) or when a healing potion has been taken. It’s not as if the arithmetic becomes complicated, but it does segue into being somewhat opaque. It’s easily resolved through the use of your own counters, so even in the worst case it’s not a big deal. Welcome to the Dungeon then is relatively straightforward from the perspective of fluid intelligence, but costly from the perspective of memory. We address the usual question here – is it fun if you can’t meet that challenge? Here the answer is – probably not. While there is a degree of ‘people reading’ that can be employed to work out when to jump off of Mr Bones Wild Ride it’s mostly a case of mentally walling off probabilities and assessing them on a turn by turn basis. That assessment will change as everyone takes their turns – and the issue there is that you commit yourself to a full round of play if you draw a card. Just because it made sense when you made the decision it doesn’t mean it will when it comes time to live with the consequences. In that respect, it’s necessary to internalise a decoupling of your action to outcome throughout as a natural result of the momentum of play. If you can’t do that well I suspect your success in the game is likely to be altogether more random than might be enjoyable. Success and failure is likely to be frustratingly arbitrary, and while the game doesn’t eliminate players from a single misstep it does make the cost of failure higher than would be appropriate for a blanket recommendation in this category. As such we recommend Welcome to the Dungeon then for those where fluid intelligence impairments must be considered, and do not recommend it for those with memory impairments. 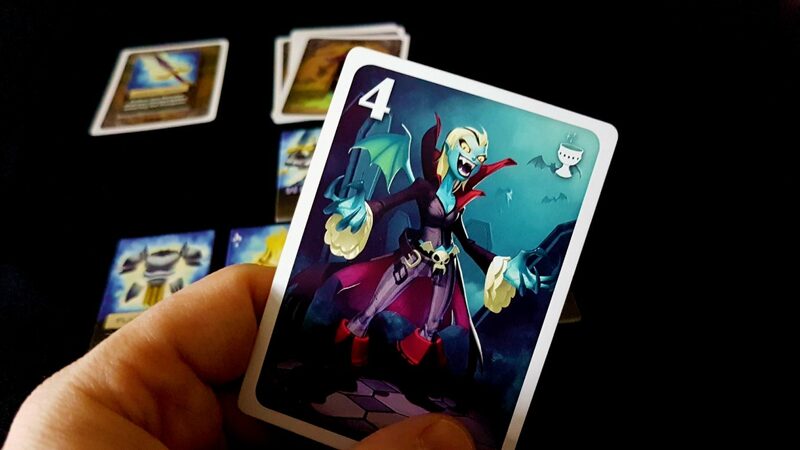 Welcome to the Dungeon incorporates player elimination, but it does it in a less cruel way than is usually the case. You don’t instantly get knocked out of the game, you lose one of your two lives. As such if you end up sitting forlornly on the spectator benches it’s because you didn’t become appropriately cautious after your first warning shot. That’s important, because while individual rounds of Welcome to the Dungeon may not be very long it might take a while before the winner is fully resolved. It’s never fun to be stuck on the side-lines observing other people having fun. The game too permits ganging up on individual players, although it does a good job in disincentivising it. Once a player has committed for a round, then it is they that are on the hook for entering the dungeon if everyone else decides to pass. That creates a scenario where someone can be goaded on and on only for everyone else to take a step back and let them take the punishment. However, if that’s done too early and too readily all that will happen is that the ‘bullied’ player will happily pick up an easy point as their hero steamrollers everything in the dungeon. The extent to which players would have to co-ordinate in order to effectively bully any specific target would be considerable, and this in turn would suggest deeper problems in the group than anything that can be proximally associated with the game. A more significant problem is that Welcome to the Dungeon doesn’t easily permit players to undo mistakes. If you draw a card, you’ve committed to the next round of play regardless of what happens in-between this and your next turn. If everyone else passes, you don’t get to bow out at all. You’re deciding every turn not on whether you’re entering the dungeon now but on whether you’re willing to be the one that enters it in an unknowable state in an unknown number of turns. There is an inertia to play then that means you might have to live with the consequences of a mistake for a while without knowing if you’ll get a chance to make good. Dying in the dungeon isn’t a big deal, but it’s certainly possible for an unwary player to be stuck with two sequential failures before they even get a chance to begin enjoying the game. 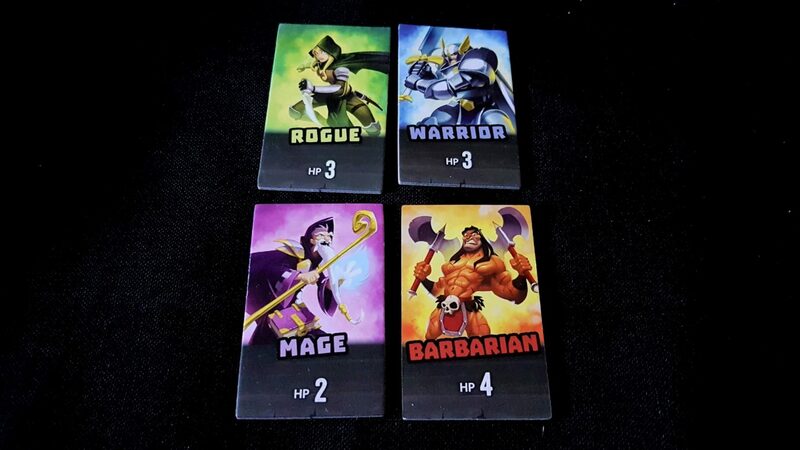 Not everyone in Welcome to the Dungeon is going to get an equal chance to play. A degree of ‘people reading’ too is important in play which is often an issue in this category of the teardowns. Now, I’m not going to claim here that anyone needs to be able to look into someone else’s eyes and determine what they just put in the deck. I’m not going to claim you need to be able to read tells or even assess whether something difficult or easy went into the dungeon. I’ve spoken about these semi-mystical abilities in previous teardowns – my belief is we give ourselves altogether too much credit in being able to do this. What you need to be able to do here is judge the room – that is a far more tangible skill. There is a degree of picking up on nervousness or uncertainty as the dungeon becomes bigger and your adventurer becomes less prepared. Generally in a game of Welcome to the Dungeon people don’t drop out over time. Instead, a tipping point is reached and everyone except for one poor sucker drops out one after the other. It’s useful to be able to get a feel for when that’s likely to happen based on how people are playing – nobody will be able to do this perfectly, but those that find it difficult to read emotional cues will be at a disadvantage. It’s not just a game of balancing mathematical probability – sometimes it’s as much about knowing when the herd is about to get spooked. All of this said though we still recommend Welcome to the Dungeon in this category. What concerns we have expressed here are mitigated by the design of the experience – it’s not wholly a game of reading people, only partially. It’s not a game where the cost of failure is especially high, and even though it has player elimination it’s of a peculiarly non-aggressive style. Players need to be able to draw a card and view it in secret, but that’s the only activity that requires any single individual to perform it. Everything else can be handled by other members of the group without game impact. If there are no physical impairments that would prevent this, the game is fully playable without compensation. You don’t even need to hold the cards – they’re kept only as long as needed to make a decision as to their destination. If this is likely to be a problem, the game also fully playable with support. A card can be drawn and shown to someone without anyone else seeing it, and then all a player has to do is indicate verbally or otherwise whether the card is to go in the deck. If it’s not, all they need to indicate is which piece of equipment is going to be used to buy its removal. As such, we strongly recommend Welcome to the Dungeon in this category. Communication isn’t required for Welcome to the Dungeon. As discussed above in the section on emotional accessibility though it does help if someone is able to pick up on when the rest of the group is getting skittish. Sometimes all that’s stopping the entire flock from bolting is that nobody has done it yet. Otherwise there’s no serious reading level associated that can’t be overcome with crib sheets and simple familiarity. You don’t have to say a single thing other than an occasional outburst of ‘Oh, you are a bunch of complete and total bastards’. That’s something that can be expressed across any number of linguistic and expressive barriers, so it’s not likely to be a problem. Bluffing is possible in the game, but it’s primarily handled through emotional rather than communicative triggers – uncertainty or enthusiasm versus ‘OH MY I JUST PUT A DRAGON IN THERE’. 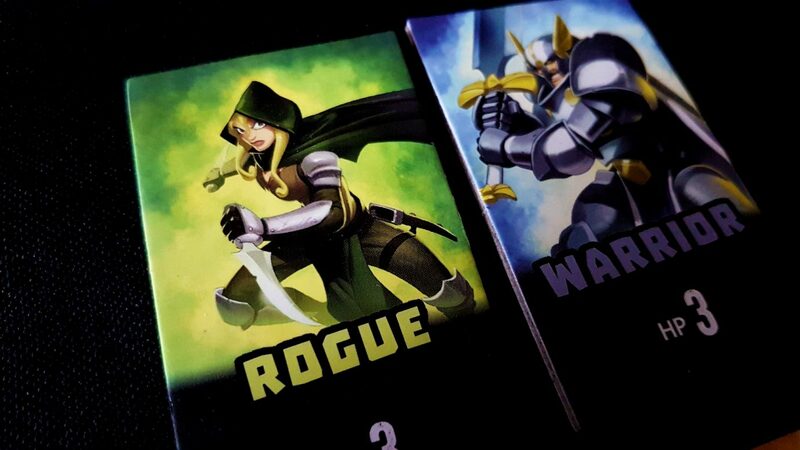 The heroes in the game are made up of three men and one woman. There’s no reason why that couldn’t have skewed more equitably. Don’t get me started on Jessie’s Girl. The manual though doesn’t default to masculinity, which is always good, and while the monsters contain only one obviously female character it’s harder to get worked up about a gender balance in the cannon-fodder baddies. That may be its own kind of sexism, to which I’ll say mea culpa. At an RRP of around £12 Welcome to the Dungeon is an intensely affordable game. However, it supports a maximum of four players and that puts it in a somewhat weird space in a game library. Most social games, of which this is definitely one, tend to be more accommodating of larger groups. Skull for example supports as many as six at roughly the same price point. However Welcome to the Dungeon does scale more elegantly downwards than Skull – it plays fine at two players, good at three, and best at four. As such, depending on the composition of your regular game nights, it might just have the edge. Still, even if you do have a large group Welcome to the Dungeon is also quite fun to watch because it’s always enjoyable to see someone push their luck a bit too hard and end up being screwed for it. Or pushing it just the right amount and achieving a stunning and unexpected success. Welcome to the Dungeon doesn’t have a hidden hand of cards, but it does require that a player be able to make use of a single hidden card temporarily. That’ll be simple enough for those with physical impairments or visual impairments, but it might become a more problematic issue for the combination of these. Holding up a card for someone else to see requires them to be able to see it, after all. At around a thirty minute play-time, Welcome to the Dungeon is unlikely to exacerbate issues of discomfort. However, play-time can be highly variable and the involvement of any individual player will not necessarily be equal. There’s not a lot of downtime between turns, but there can be a lot of downtime if a player is eliminated early. That can be an issue with certain categories of emotional and cognitive impairment, but it might also be a problem generally when dealing with symptoms of modulating severity. Being on the side-lines after all has a tendency to focus the mind on the negatives. While Welcome to the Dungeon is a competitive game, it’s also not one where players have much opportunity to actively undermine each other outside the normal rhythm of passing. Everything when the adventure is being played out is completely transparent and does not yield itself well to ‘unsporting behaviour’. As such, it’s not likely to disincentivise other players offering accessibility support to others where it’s needed. While Welcome to the Dungeon isn’t a game I’d like to recommend to those with issues of memory, it’s one that I might suggest across the board otherwise. The rules are simple, the gameplay involving, and at the retail price-tag it gives you a lot for a small outlay. While box size and component complexity doesn’t necessarily predict accessibility (for example, see our Dobble and Once Upon a Time teardowns) it’s certainly the case that smaller box games have traditionally done quite well in these assessments. Welcome to the Dungeon holds true to that trend which is always good to see. We gave Welcome to the Dungeon 3.5 stars in our review – it’s very enjoyable in short spurts, and packs enough novelty into its tiny box to keep you coming back. Ultimately though it bangs its head against the ceiling of the design space in which it functions – there’s only so much a game like this will be able to achieve. However, I’d certainly recommend people pick it up if they think they can meaningfully play and for most there’s every reason to believe they should.